"It is easier to imagine the end of the world than the end of capitalism. After 1989, capitalism has successfully presented itself as the only realistic political-economic system - a situation that the bank crisis of 2008, far from ending, actually compounded. The book analyses the development and principal features of this capitalist realism as a lived ideological framework. Using examples from politics, films (Children Of Men, Jason Bourne, Supernanny), fiction (Le Guin and Kafka), work and education, it argues that capitalist realism colours all areas of contemporary experience, is anything but realistic and asks how capitalism and its inconsistencies can be challenged." "Following the biggest financial collapse since the 1930s, the apparent relief that astronomical government bailouts have returned us to ‘business as usual’ is surely proof that the expression ‘there is no alternative’ – once an extremist ideological battle cry – is now an accepted mainstream orthodoxy. This is a paradox, expressed in the somewhat desperate-sounding subtitle of Mark Fisher’s book: on the one hand, the neoliberal faith in markets has been spectacularly discredited before the eyes of the world, together with the notion that obscene personal wealth – exemplified by banker’s bonuses – is a sign of general economic health; on the other hand, the only available response to such a monumental failure appears to be the most cautious, ameliorative regulation to get the old system up and running again. 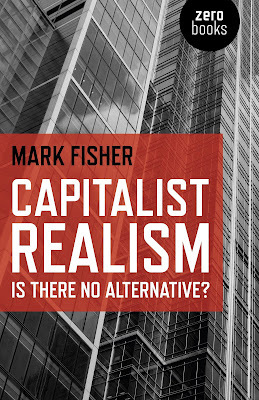 Fisher defines ‘capitalist realism’ as ‘a pervasive atmosphere, conditioning… the production of culture… the regulation of work and education’, something which acts as an ‘invisible barrier constraining thought and action’. The reality certainly exists – vouched for by the symptomatic analysis Fisher performs on a multitude of cultural phenomena; and yet, crucially, a ‘reality’ that always includes, and depends upon, our implicit acknowledgment of it as delineating the realms of the possible. ‘Being realistic’ is often a case of ‘reflexive impotence’: seeing as we are helpless to change anything, why bother trying? This attitude is evidently true – think of the Iraq War protest – but nevertheless self-fulfilling. With this in mind, Fisher’s book is, despite the oppressive diagnosis, a much-needed plea that the present economic crisis be seized as an opportunity; a tipping point that allows us to build an alternative to this increasingly intolerable and ultimately unsustainable mode of living. The book both introduces (illustratively, through films, novels etc) and is grounded in postmodern theory, from which two ideas are of particular significance for the more specific analysis. First, Slavoj Zizek’s notion that we believe (eg in capitalism) through our actions, not our inner convictions. Second, the idea that we have definitively moved beyond an age of traditional authority: from a disciplinary regime to a control society, in Gilles Deleuze’s terms; from a prohibitive paternal function to one that, in Zizek’s terms, compels us to enjoy. Fisher’s critical approach is to focus not on the exploitation or class division which capitalism is predicated upon, but on those areas where it is demonstrably dysfunctional according to its own criteria. Neoliberal apologists can hardly claim that free market capitalism promotes equality; but our consumerist economy does promise pleasure and happiness, above all else. Why, then, are we in the UK suffering from epidemic levels of depression? Fisher’s other test case is bureaucracy: it was the one thing even those on the left would expect the dynamic, ruthlessly efficient business model to have all but eliminated in those areas where it replaced the ungainly apparatus of centralised control. The reality, in our deregulated, subcontracted and globally outsourced economy, is just the opposite, as any encounter with ‘the crazed Kafkaesque labyrinth of call centres’ will testify. These inconsistencies are examined within the field of education. In one of the most revealing sections of the book, Fisher speaks of the ‘depressive hedonia’ he encountered among his FE students, who were defined in post-disciplinary terms as consumers, brought up on instant sensation-stimulus gratification and seemingly unable to pursue anything except pleasure. Fisher also has much to say about the auditing culture which has infected education, and lead to a virtual world of data generation and manipulation where targets become ends in themselves in the race to improve not teaching and research, but public image. In what is a more widespread characteristic of capitalist realism, Fisher points to how market thinking becomes internalised – self-assessment turning workers into their own auditors. Attention to the prosaic seems the right approach for any anti-capitalist endeavour. Yet there is a further, ontological dimension to the book. At some fundamental level we humans need the new: experimental forms, fresh visions and ideas for living. The most upbeat prognosis for liberal democracy and market-driven technological progress cannot disguise the sense of exhaustion and sterility, of things never fundamentally changing, of conformity and ‘the end of history’. The transformation of everything into exchangeable commodities, or into purely aesthetic objects, is a form of living death. The triumph of neoliberalism may have altered our world but, as others have insisted, it represents a massive restoration of wealth and power. For Fisher, if a left alternative is to be put forward as a rival rather than a reaction, it cannot return to the old ‘disciplinary’ structures beloved of trade unions (Fisher’s advice to them: get immanent); rather it must ‘build on the desires which neoliberalism has generated but which it has been unable to satisfy’. After all, who wants ‘inflexibility’ and a return to fordist routine? The call center experience distils the political phenomenology of late capitalism: the boredom and frustration punctuated by cheerily piped PR, the repeating of the same dreary details many times to different poorly trained and badly informed operatives, the building rage that must remain impotent because it can have no legitimate object, since-as is very quickly clear to the caller-there is no-one who knows, and no-one who could do anything even if they could. Anger can only be a matter of venting; it is aggression in a vacuum, directed at someone who is a fellow victim of the system but with whom there is no possibility of communality. Just as the anger has no proper object, it will have no effect. In this experience of a system that is unresponsive, impersonal, centerless, abstract and fragmentary, you are as close as you can be to confronting the artificial stupidity of Capital in itself. "This is a great little book. The Continental tradition in philosophy is still unparalleled in the resources it has to offer theorists attempting to characterize contemporary society. The angles of vision it can provide, the theoretical models, the sentiments for the expression of which it provides concepts – in the right hands this is powerful stock, accumulated through a century of reflection. Fisher, with skill, employs this body of Theory to open up and understand the machine, and there is enough in the way of observation and concentrated thought, that one is not left merely hanging onto a bag of untamed abstract nouns. Capitalist Realism itself, is basically the cultural condition in which, with Marx, we stare with clear eyes at “naked, shameless, direct, brutal exploitation” but yet... keep calm and carry on. We are not unmoved exactly; but yet still we do nothing. The details of why and how, and the ramifications in various domains, are the object of the book. On any of the areas he touches, abstract or concrete, Fisher is illuminating. For example, take the 3-second time-consciousness peculiar to our popular sphere. The economic necessity to reduce everything to purely quantitative relationships engenders this attitude, because future and past loose their particularity, becoming mere versions of the present, identical in quality. This becomes a general mode of relating to the world, of ‘enframing’ it, in Heidegger’s language. We are merely “going forward” into Q2, Q3, Q4... But, the future is the realm through which we imagine that things might be different, and the past is where we see how they were different. And so “it is easier to imagine the end of the world than it is to imagine the end of capitalism” (2). (Incidentally, it becomes apparent, through such examples, how legion and subtle would be the alterations effected upon deep cognitive features, by the turn to Angel Economics, in which there is no such need to render everything quantitatively commensurable). But aside from metaphysics, Fisher can cast light on many more prosaic matters. For example, he was an adult educator, and paints a portrait of British youth that is striking, arresting, and depressingly familiar. Generally, the book bristles with insights. Its slight defect is its journalistic “we”; or, in other terms, the tendency - common to Continental philosophy - to see the structures it identifies as universal, inescapable, brooking no exception. It is the over-extension of Concepts. Adorno used exaggeration as a literary-cognitive device, and that’s OK, but one has to remain in control. Take this: “For most people under twenty in Europe and North America, the lack of alternatives to capitalism is no longer even an issue”. To some degree this is true. However, a closer look would reveal that throughout this stratum, within numerous subgroups - each in their different ways - there are explorations taking place of ways of doing things which go beyond capitalism. Most do not explicitly or self-consciously see things in those terms of course – to provide that awareness of the wider context and meaning, is the role of a movement (see below). But still. Thriving knitting groups; shared amateur photography (with a high degree of editing skill and artistic vision); open-source software; filesharing (the engine for this comes from the young, and many take this source of acquiring data simply as axiomatic); all sorts of geeky DIY, from biotechnology, pharmacology, permaculture, health analysis and augmentation, robotics; binraiding (shops throw out great stuff); swapping and ‘freecycling’ consumer goods; etc etc. There is a homebrew industrial revolution, and the young are often on its leading edge. Consider another example, about the commodification and incorporation of opposition. Fisher coins a great word, “precorporation”: “the pre-emptive formatting and shaping of desires, aspirations and hopes by capitalist culture.” Everyone would be able to adduce their own examples of this. Fisher gives the paradigmatic case of Kurt Cobain. He knew not just that his expression of opposition was a mere commodity; the self-consciousness of this situation was also part of that product. And further iterations of the relation (self-consciousness of self-consciousness of opposition being commodified) do not change the basic situation, so there is an impasse. Furthermore, as is its general mode of operation, capitalism does not merely appropriate but actually sets about producing cultural artifacts with pre-packed anti-capitalism in them. Taking a recent example, Fisher notes that “[a] film like Wall-E exemplifies what Robert Pfaller has called ‘interpassivity’: the film performs our anti-capitalism for us, allowing us to continue to consume with impunity”. On the other hand, there are three basic points. First, it is self-evident that music (or any other art) on its own cannot itself bring about change to the basic socioeconomic and political order (even though, listening to many individuals talk about the popular cultural scene stretching from the late ‘60’s to the early ‘80’s, it becomes apparent that they actually thought this was the case). So how serious is such incorporation, really? Second, putting it simplistically, there is always a kind of exaggeration, as well as a certain conceptual confusion, when it is said that this-or-that artwork is incorporated. It is an exaggeration because, I submit, there is a great deal, in a great deal of art, which is not merely reducible to and compromised by capitalistic relations, but which transcends them, and can inspire those receptive to it. While, it is a confusion, because such incorporation is often inferred from the mere fact that the artwork is bought-and-sold, i.e. is a commodity in its economic form. I don’t say artworks are unaffected by their being commodities; but there is a distinction between use-value and exchange-value. Third, and more importantly, all it would take for artistic works to become un-commodifiable in a stronger sense, would be the existence of a genuine anticapitalist political movement to which they could attach themselves. If there were such a movement which threatened capital, and it was generally known that some work expressed its aspirations, you can be sure it would become indigestible by MTV, the Wellcome Trust, or any other 400ft disembodied capitalist throat. “Capitalist ideology in general, Zizek maintains, consists precisely in the overvaluing of belief- in the sense of inner subjective attitude – at the expense of the beliefs we exhibit and externalize in our behaviour. So long as we believe (in our hearts) that capitalism is bad, we are free to continue to participate in capitalist exchange. According to Zizeck, capitalism in general relies on this structure of disavowal”. The other criticism you might make of the book is linked, though different. It is not so much a failure to penetrate appearances – how could you say that of a work like this, which reads society’s dreams like a novel? - but that, qua purely cultural critique, there is a natural tendency to despondency because one cannot feel or see those longer-run economic processes which might change the game. Fisher is no doubt aware of the many classical Marxist graphs detailing the falling rate of profit over the last half century, noses pointing down (Brenner’s version below. The overlay from 1980 is from Goldman Sachs). These are telling us, with all the force of natural law, that things cannot stay the same. He is probably also aware of Ray Kurzweil’s very different graphs (e.g. below), equally game-changing (and which need now to be the prime focus of attention by people concerned with justice). But if he is aware of this work, this doesn’t show, and that’s a big deal, because it’s in these under-the-surface processes where capital’s realism really lies. A defence Fisher could legitimately make is that (as against the first criticism) he is describing the broad mainstream, and (as against the second) that saying “Things Will Change” doesn’t help much. Fair enough. So what is to be done? The short and glib answer is that a proper political movement needs to be constituted with the basic aim of fundamentally restructuring socioeconomic relations. Fisher – who himself refers to the need for a “new (collective) political subject” – knows this. Quite a few on the Left know this (especially if one lowers the threshold and allows them to know it ‘in their heart of hearts’). A vast number in the wider society know it. The real question is not so much the ‘what’ as the ‘how’. Fisher makes a few tentative suggestions, alongside his basic call for the abandoning of gestures and spectacles. They are not so much definite strategic proposals, as contributions to delineating a basic attitude or stance. (This is worthwhile. The hard Left is peculiar at the moment. Popular discontent with the social status quo runs extremely deep and wide, and, in fact, is even often very clear about the identity or cause of its problems, viz. capitalism. And yet the hard Left virtually never seems able to tap into this. A major part of the difficulty is, for want of a better word, the ‘image’ of that Left. But it is not a mere matter of re-marketing and re-branding. The image the hard Left has is broadly what it deserves. For it is not nearly expansive enough; it is not ambitious enough; it is not imaginative enough; its attitude towards strategy is consequently far too narrow. Setting out a few lines in the sand, in this circumstance, supplies useful orientation). One thing Fisher suggests – after a line of argument to which it is impossible to do justice in a short summary – is an attitude towards culture, on the part of artists, which he (semi-playfully) embodies in the figure of the Marxist Supernanny. The focus-group-led market has delivered us the basest crassness, Fisher contends, because “...even when they generate commodities that are immensely popular, [it can’t be counted as a mark of success, for the reason that] people do not know what they want... [For] the most powerful forms of desire are precisely cravings for the strange, the unexpected, the weird”. He gives some examples of the experimentalism and quality that the post-war BBC was capable of producing, and presenting to a mass audience. Whilst one could haggle about the details of his interpretation of what lay behind this, the fundamental point stands firm. Another suggestion, equally solid, is that we “...must convert widespread mental health problems from medicalized conditions into effective antagonisms. Affective disorders are forms of captured discontent; this disaffection can and must be channelled outwards, directed towards its real cause, Capital”. This, it should be said, is the conclusion to a penetrating analysis of the precise character of widespread contemporary mental health problems, and how they originate within features of our culture. No practical vehicle for executing this channelling-outwards is specified, but one can’t have everything. In any case, there are lots of motley projects around from which one could draw inspiration. Another suggestion is a sort of strike-strategy for white-collar workers. Some of the strongest parts of the book are the analyses of bureaucracy (Kafka is the basic reference; Lacan deepens the probe). In a wonderful characterization, Fisher conceptualizes auditing – i.e. the basic means by which today’s excuse for Social Democracy proposes to humanise the market relations it establishes everywhere – as a fusion of PR and bureaucracy. “[T]he bureaucratic data is usually intended to fulfil a promotional role... [M]uch of the so-called information has little meaning or application outside the parameters of the audit: as Eeva Berglund puts it, ‘the information that audit creates... is so shorn of local detail, so abstract, as to be misleading or meaningless – except, that is, by the aesthetic criteria of audit itself”. People carry on with this despite knowing its ridiculousness (that kind of attitude is also superbly analysed). Fisher, simply enough, calls for a mulish foot to be put down. Other than this, there is a more general programmatic call. “...[T]he goal of a genuinely new left should not be to take over the state but to subordinate the state to the general will. This involves, naturally, resuscitating the very concept of a general will, reviving – and modernizing – the idea of a public space that is not reducible to an aggregation of individuals and their interests”. Now, if that is to mean anything, then surely we have to speak (as said, above) about a political movement - in generously wide senses of those terms (“political” and “movement”), but not so wide as to be meaningless. (This might seem a contradiction, insofar as a political movement will of necessity express a particular will. But that is a fatuous criticism, beloved of so-called liberals, who fail to see that under capitalism the vast majority of people constitute the poor, the oppressed; that this position is actively created by elites; that therefore the contradiction is merely a scholastic label). At the centre of such a movement needs to be the vision of the society it aims to bring into being. One aspect of that is its basic economic structure - Angel Economics is a contribution to figuring out what that might look like. Of course a society is much more than an economic structure. But in general terms I suggest that real progress can be made by theorists in all domains adopting the perspective from which Angel Economics is written, a perspective different from the currently-available (analysis of what is or what has been; practical policy for the rearrangement of what is; imagining what is not, but calling that ‘fiction’); and, with straight-out-bare-faced-naivety just sketching how things might be done. Angel Economics provides a general framework for some of these domains (workplace structure, the basic nature of social interaction, etc) which can make the task easier. Other domains are best conceived completely independently (see an interesting recent Rouge’s Foam post on 21st Century music for an idea). The point is that you can be sure that a well-articulated vision, bubbling with proposals and ideas, many-organed, diverse in its make-up, uncompromising, generous in its life and spirit – such a vision would easily pull people out of their torpor, and all the cynicism and bitterness would give way. The reeds and mud hanging from Mr Swamp Monster can be removed, and he will buff himself up. A vision alone is not sufficient, of course. There is an important role for analysis. In developed, post-modern hyper-capitalist societies, the socio-cultural structure is exceedingly complex, and it would require a great backbone of forensic analysis in order for a movement to successfully navigate within it. Michael Hardt relates an amusing anecdote, where in discussion about political strategy with a South American friend of his, the latter suggested: “Why don’t you just go to the hills?” Although not on the same order, the myopia which affects the contemporary hard Left – with its pathetic electoral campaigns, and a Weekly Worker newspaper-based modus operandi taken straight out of Moscow 1905 – is of the same kind. The strategic failing is the consequence of a prior analytical failing, which ignores the general lifeworld that most people occupy. Fisher’s book is exemplary of the kind of edifying analysis required. Vision and analysis – we are still only in the head. But there is no lack of potential constituencies and social tendencies, to form the actual walking meat. (I have detailed a few that come to mind [two thirds down this review of Commonwealth], though there will be many others). And of course, conjuncturally, these layers are only going to grow as the elite attempt to fasten the crisis onto the backs of the working class. Still, potential constituencies, and tendencies, comprise a drift rather than a movement. The latter requires some kind of structure or coherence or unity or self-consciousness. Of course, this has been a sore point on the far Left for some time now. For the organizational instantiation of this ‘unity’ has been seen as having to be something like a party, headed by a leadership; and, more broadly, the aim of such an entity has been the conquest of a larger body for that unity - state power. And the problem is – the contention has been - that any victory, in these terms, is necessarily pyrrhic. This whole issue has probably been over-complicated. Taking control of the state in any narrow way, through something like elections in a Western country, in today’s capitalism, is clearly an impossibility for a genuinely left party. (Getting one or two MP’s elected is a different matter, and a decent contribution to strategy. Likewise, pressure to change the legal constitution, on an ad hoc basis and as part of some campaign, is also good strategy). Restructuring of basic socioeconomic relations must, rather, take place for the most part autonomously of the state, within the movement itself, as an ordering of its own organs. This is simply the strategy of hegemony, applied not just to ‘intellectual conceptions’ but also to institutions. And again, the point is that the constituencies and social tendencies are extant, today, for this to seem quite possible. And yet one still needs an engine. Demonstrations and election-runs are often merely used today by Left parties as a focus - as something to do, to put it at its most basic. These foci create the concentration of energy expended on them. The trouble is that these foci are merely reactive, or symbolic. The movement needs an autonomous focus. If not a perpetuum mobile, this would at least give it in control of its own energy. Capitalist realism… entails subordinating oneself to a reality that is infinitely plastic, capable of reconfiguring itself at any moment. We are confronted with what [Frederic] Jameson… calls “a purely fungible present in which space and psyches alike can be processed an remade at will.” The “reality” here is akin to the multiplicity of options available on a digital document, where no decision is final, revisions are always possible, and any previous moment can be recalled at any time. To Malabou’s “there’s no alternative,” Fisher poses (not to Malabou herself, of course) the incessant “Is there no alternative?” and I highlight the posing of this question as a question for three reasons: (1) The modus of the question that poses itself is one that looks for an answer from the outside instead of meekly repeating what is provided in the given set of knowledge, however “elastic”; (2) It is also to be read in the plaintive “really, is this the best we can do?” tone of voice that we should use to f*ck (hey, it’s a blog review: if I was publishing in a journal, it would be “interrogate” or “critically analyze”) with the capitalist “realists” who tells us that we must face up to the cold, hard fact that there is no alternative even as they must admit, well, it wasn’t always this way (see Malabou above) and thus there can be no naturalism to anchor this “realist” claim. Fisher writes: ”The power of capitalist realism derives in part from the way that capitalism subsumes and consumes all previous history: one effect of its ’system of equivalence’ which can assign all cultural objects … a monetary value”. The realism dictates that it is governed by no “transcendent law.’ This makes capitalism like the Thing in John Carpenter’s film of the same name’ [note to self: get this film]: a monstrous, infinitely plastic entity capable of metabolizing and absorbing anything with which it comes into contact”. What Fisher ultimately diagnoses is a failure of political imagination: “we need to begin, as if for the first time [note; not for the first time - he's not pedantically acting as if he is alone, or that this is alone his discovery: egalitarianism, rather than scholarly naming and owning theories, begins here] to develop strategies against a Capital which present itself [everything in Fisher's analysis circles around this "presents itself" and what this presentation of itself means] as ontologically as well as geographically ubiquitous”. Thus what presents capitalism as the horizon of our time is not just misguided anti-historicism akin to those who think the Greeks had capitalism and Jesus was charging for loafs of bread (I swear I’ve seen that somewhere in my travels in the U.S. South); it is a philosophy of the victors at a time when its victory produces a formless form that is destroying all “traces” (I use this word purposely) of a world worthy of the name. "I remember being enthusiastic about politics, I remember believing that a person, or group of people, has the power to change things, and I also remember, very clearly, a million people marching on the streets of London to protest about the war in Iraq, and being flatly ignored. It was a significant moment – not because lots of people came together to protest at something they knew to be wrong, but significant because of the ease with which those in power ignored the public outcry. Nowadays,the protest is no longer a protest, the protest is a carnival, a party, a “hey let’s all have a far out time, maaaaan, a good-time happening!” At least at the initial Iraq protests had something behind them – as the recent G20 protests (which were aimed at everything and nothing) demonstrated, apart from anarchists and hippies, there is very little general will to protest amongst the younger generations. Why? Firstly, because we know that they don’t work. Secondly, because we no longer believe that there is an alternative to capitalism. But the failure of protest, the failure of the ideology of the 1960s generation, is endemic of a wider cultural shift, as Mark Fisher brilliantly analyses in his Capitalist Realism: Is there no alternative? And he’s perfectly placed to do so. Mark is of a generation slightly ahead of me, a generation that grew up around punk rock, post-punk, a radical left and Thatcherism, a generation of people, between 35 – 45 years old, who, while they were growing up, still believed in alternatives. He’s probably from the last generation to do so. I’m from a later generation, one who grew up with the rise of the internet, brit-pop and the YBA, with the neo-liberal promises made by New Labour. The radical left is defunct and all we have been left with are the ideology of Neo-liberalism. One of the anecdotes in Capitalist Realism recalls Gordon Brown giving a speech in which he says that his mother was an entrepreneur, a business woman. When quizzed on it she said that she had done a little bit of admin work, but that was all We have gone from the old world, in which members of the left would lie about their past to sound more working class. Now we live in a world in which the left lies in order to be associated with business, with capitalism. And there is, as we are all too aware, no alternative in mainstream politics. Left of the centre, right of the center, they’re all the same. The first thing that Mark does right is to analyse our condition as capitalist realist, sidestepping the much bandied about term of “post-modernism.” Post-modernism, as a word, has become a self-fulfilling prophecy – a word that says that nothing has an intrinsic meaning no longer has any meaning itself. Everything is “post-modernism” (or pomo) – architecture, thought, books, art, film, etc etc, and many people would be pushed to define what it actually means. Capitalist Realism, by contrast, is specific – a world, this world, our one, in which capitalism has become naturalised, unquestioned, without alternative. We have reached a point in politics and culture in which we accept capitalism as the very grounding of our lives. There is no question any longer of a different system, there are only propositions on how to modify it, how to work within it. Is this all we have left to us? Is there nothing better? And this system, as Mark analyses, is not the benign, taken for granted backdrop that we think it is. Capitalism presents itself as the only possible world. In this way it is Leibnizian – or, to be more specific, Leibnizian without God. ‘This is the only possible world’, we believe, as though it were the most obvious thing in the world (we couldn’t possibly believe that it is the best of possible worlds, resigning ourselves to the fact that it is). As Mark points out, the real power of capitalism is that by naturalising values it stakes its claim as reality. The examples of education, mental health and bureaucracy that Mark uses are pertinent. He uses them to show how the system has covertly transformed a generation into being a blip generation, a generation for which everything must be in tiny twitter-sized packages, for whom reading is boring (not the content of books, as Mark points out, but reading per se). He looks at the rise of depression within late capitalism – unsurprising as the depressed person is the person for whom there is no alternative. Even those of us who aren’t depressed often experience a low level of anxiety every day of our lives – do I have enough money? Am I too fat? Am I too thin? Should I be exercising more? Should I stop smoking? And he rightly cites Kafka in relation to the current baroque bureaucratic system of quangos, committees, red tape and call centres that we acceptingly exist in (I have spoken to four call centres today, I do it now with quiet resignation that this is the way things are). Additionally he talks about the infinite deferral of the constant auditing processes. My fiancé reminded me of an incident at a college where he used to work. The lecturers were told at short notice of an inspection. They were all told that they had to make posters demonstrating their subject areas, graphs and charts to show that activity was going on. D flatly refused to do it but amongst younger members of staff there was a flurry of anxiety and concern, frantic photocopying to make sure the right paperwork was in place. The inspector didn’t even audit all members of staff. But once one audit is over it’s time to prepare for another one – constant anxiety, constant pressure. Into these discussions, Mark weaves his own experience as a teacher. Often examples taken from an author’s own personal experience can be jarring but readers of Mark’s blog will know that he is an expert at sensitively perceiving what, in his own experience, is applicable to a more general state of affairs. The right particular can often be paradigmatic of something more universal. Unsurprisingly, I’m all in agreement with Mark that Spinoza’s philosophy is immensely valuable when analyzing capitalism. Spinoza is all about us being bombarded by images that we mistakenly take for reality, about how we are led to believe we are free when we’re systematically determined. For Spinoza, cold rationalist understanding is what it takes to develop our personal freedom. And it is this rationalist language, pedagogical language, that Mark employs in his book. As well as using Spinoza, Mark feeds in the theories of Zizek, Lacan, Deleuze & Guattari, etc etc. When you’re using these theories it’s easy to make one of two mistakes. The first is that you speak only in the language of the thinker whose theories you’re using – Deleuzospeak, Lacanobabble etc etc. This makes the work only accessible to a specific audience of about 10 people who speak that language. The other mistake is that you trivialise it by trying to make it palatable to some imaginary ‘everyman’. Mark does neither of these. He expertly balances a line that weaves complex theory into a narrative that neither patronises or baffles the reader. It’s what philosophy, what thought, should aspire to. Excellent review. I stumbled across it because of a Google Alert for "Homebrew Industrial Revolution," the title of a forthcoming book I've made available as an ebook. Not to get all dialectical, but whether a given phenomenon is commodification/cooptation of dissent, or an internal contradiction, depends on which victors write the history books. My own inclination is to believe that corporate capitalism is unsustainable, and won't survive the perfect storm of terminal crises. So most of what peole like Fisher see as the commodification of dissent are really examples of capitalism trying to sell the rope by which it is hanged; a great deal of it is a last-ditch effort to incorporate elements that will ultimately destroy it. By way of analogy, corporate capitalism has attempted to incorporate networked job shop and microfactory production into a corporate framework, retaining control of finance, marketing and IP. But the implosion of capital outlays required for manufacturing makes most of their finance capital superfluous. Network technology has eliminated most barriers to direct, viral marketing. And IP is becoming unenforceable. That means that, apologies to Marx, micromanufacturing will eventually treat the corporate headquarters as redundant nodes to be bypasses, and "break out of its corporate capitalist integument."